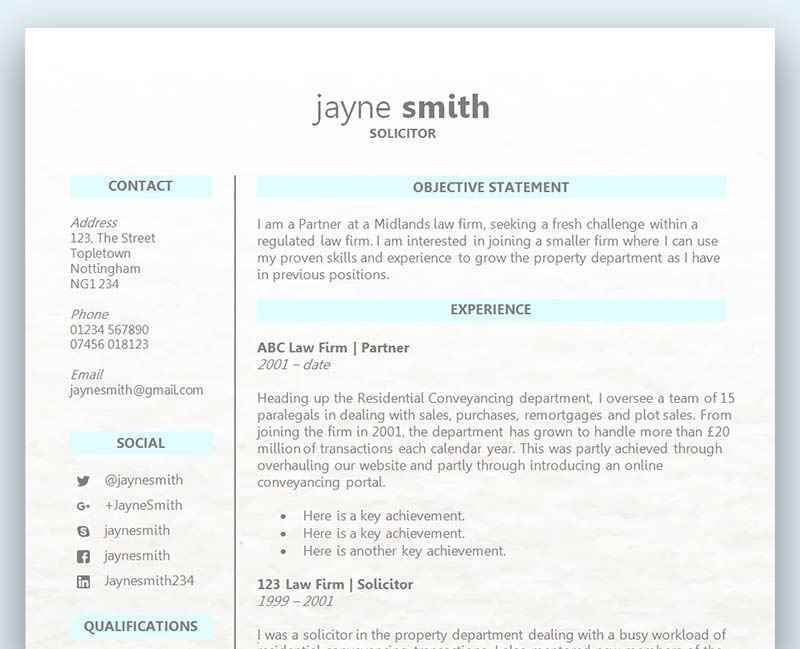 A CV template that places your personal info on one side and your core info on the other, with a bold heading and neatly organised sections. This template uses the Arial font - a classic, simple choice that is easy to read and presents your information without any distractions. Sections divide up the different parts of your CV, with capitalised headings to make the CV very easy for your prospective employers to skim through. The basic components of a CV are included in the template - work experience, education, skills and references - but these can easily be expanded if you want to include more detail, such as Professional Memberships or Hobbies & Interests. Black and white two column CV template: clutter-free with a solid easy-to-read font	Overall rating:	4.5	out of 5 based on 2	reviews. The title section of this CV template is a very subtle design element that makes your CV stand out without making it look cluttered or unprofessional. Your personal information floats to the left of the CV in different sizes of the Arial font, creating interest without being overly graphical. The rest of the CV is simply well organised, smart and perfect for a wide variety of job applications. How important is a cover letter for your CV? When a recruiter reads through the many CV’s they receive for a new position, they will often only find just a handful of cover letters attached with those applications. Many job seekers today are still making the mistake of omitting this extremely important addition to the CV, and it will make a big impact on whether or not they gain an interview. An employer is always looking for that little extra something that not only adds value but shows initiative and creativity. When an employer receives a CV with an attached covering letter, it makes a great first impression as it shows that an effort has been made above and beyond what was expected. As so many CV’s are usually lacking in a cover letter, an employer is always happy to see one and will instantly take note of not only what your covering letter has to say, but also what the CV goes on to show. A covering letter that has been tailored to the role is a great way of getting one foot in the door. Not only does it show that you’ve done your research, it also helps show the employer how you are the right person for the job. Tailoring your CV to do the same is the obvious next step, but without the cover letter you are leaving it to chance for the employer to spot that you have what it takes to be their next employee. A cover letter offers two chances for the employer to make the obvious connection, and leaves little to chance.